Question: I notice that Srila Bhaktivinoda Thakur and Srila Bhaktisiddhanta Saraswati Prabhupada were engaged in defeating the brahmanas by showing that Vaishnavas are above brahmanas. In the meetings the stalwart brahmanas accepted defeat, but afterwards they all forgot. Is this because it is a hidden treasure and can only be received from the self-realised soul? If it is not the case then after being defeated they would surely remember that Vaishnavas are above mere ‘brahmanism’ and they would follow that. Krishna replied, “It is not necessary for Me to give you eyes. If I say, you shall see.” Then Dhritarastra saw the wonderful Universal Form of Krishna. He then bowed down to Krishna. But afterwards he forgot everything. And in another place we see that the position of Gurudeva is given as Saksad-Baladeva—non-different from Baladeva. Gurudeva is non-different from Nityananda Prabhu; and Nityananda Prabhu is non-different from Baladeva. The devotee worships his Gurudeva as Baladeva—as Nityananda Prabhu. In yet another place the Scriptures say that Gurudeva is Srimati Radharani. We can note too, that Baladeva has a form as a Manjari: Ananga Manjari. So what is truth, and how to harmonise it? This was the question posed by that devotee. It is necessary to harmonise everything, then we can understand what is what. First it is necessary to see what is the position of Krishna. He is the Supreme Personality of Godhead. This is the first position. When we try to realise the position of Gurudeva, at first we shall see the main glow—that everything emanates from him. And He from whom everything emanates is Krishna. But Krishna is not alone. He is svasakti saktimana — Krishna is with His Power. When Krishna and His Power come to play, His form is Radha-Krishna. It is not that this is happening just for some time, but it is eternal. It is not that yesterday this happened but the previous day Krishna was alone. No. Everything is eternal and transcendental, so everything is living within consciousness, and that consciousness is Krishna consciousness, and Krishna is the Supreme Personality of Godhead. This is the first thing we are to consider. Nobody can create His Pastimes, and Krishna also does not create them. His Pastimes are eternal, therefore nobody created them. The Supreme Personality with His Power is eternal, and that Power is sometimes attached with Krishna and sometimes detached. When detached, still there is full power with Krishna. Devotee: That last sentence is very difficult to understand. Srila Govinda Maharaja: There is power, and there is the powerful. If you detach power from the powerful is there still power with the powerful? Srila Govinda Maharaja: With the powerful there is full power even though power may be detached from the powerful, and that is called achintya, incomprehensible. Question: Do amsha expansions such as vaibhava-vilasa also follow this principle in that He expands into other forms but without Himself becoming diminished? Srila Govinda Maharaja: Yes. 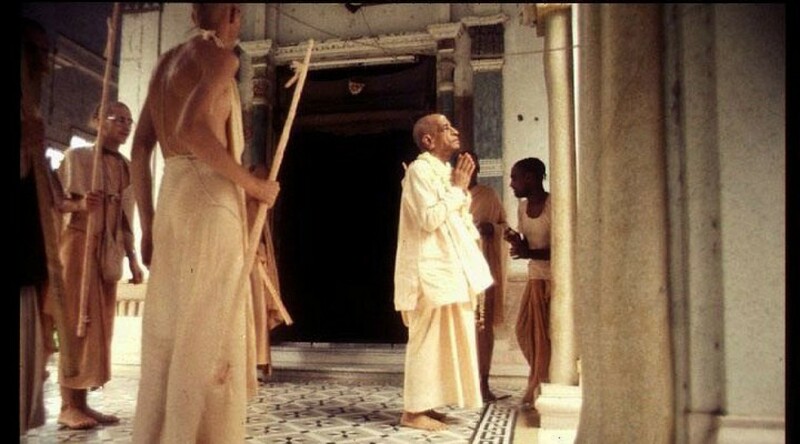 An example is given by Srila Krishna Dasa Kaviraja Goswami: if from one candle another candle is lit, that second candle is full with its power but without any loss from the original candle. Radha and Krishna, the Power and the Powerful, are inseparable, but when They want to play They can exert themselves separately. He is full with power and She, His Power, is also full with power! This is the point. When Krishna wants to have Pastimes, the first manifestation of His energy is Baladeva, Mula-Sankarsana. He comes out from Krishna-prabhava-vilasa. From Radharani automatically comes Yogamaya. Yogamaya and Mula-Sankarsana come out at the same time. Yogamaya takes charge of the playing ground, like the referee. She makes the rules and regulations, etc. in a way which will please Krishna, and by her will everything immediately manifests accordingly. When Krishna wishes to play, immediately everything is manifest and managed by Yogamaya. Baladeva takes the charge of all administration and He delegates charge to Yogamaya. From the Powerful comes Sankarsana, and from Radharani comes Yogamaya. Question: Sankarsana is one of the names of Balarama? Srila Govinda Maharaja: Yes: Mula-Sankarsana—the original Sankarsana. Question: And afterwards so many other Sankarsanas are manifested? 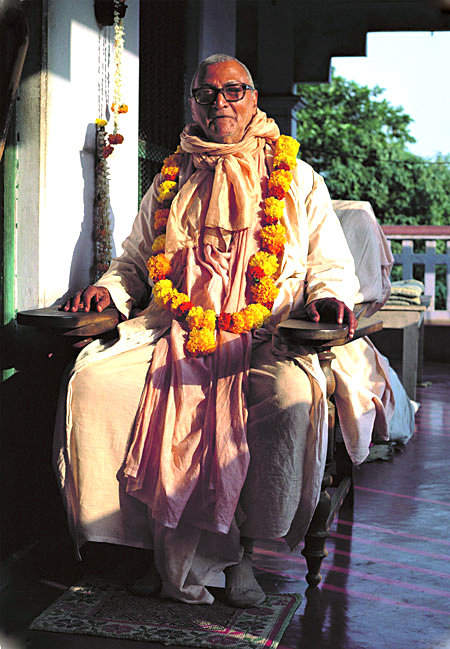 Srila Govinda Maharaja: Yes— the Chatur-vyuha. There are many expansions of Krsna and many expansions of Radharani — prabhava-vilasa, vaibhava-vilasa, etc., but in the higher plane are playing Radha-Krishna, Sankarsana and Yogamaya. These four participate there. Question: The Chatur-vyuha are not in Goloka Vrindavana? Krishna is full, and Radharani is full. When the Power comes out from the Powerful, that Power is also full. The play of that plane progresses with the continual cycle of thesis, antithesis and synthesis. Question: Even there! Srila Guru Maharaja said that all problems start from above. 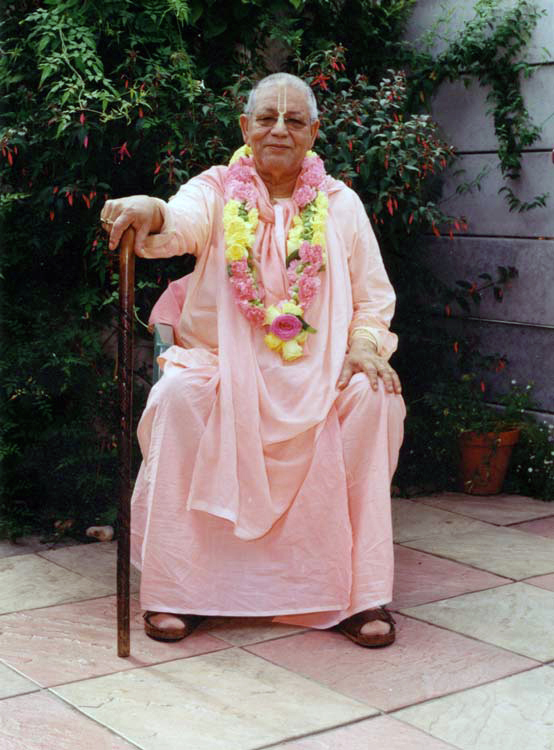 Srila Govinda Maharaj: But nothing there is bad or wrong. All, whether they are possessors of power or power itself, they worship for the satisfaction of the Supreme Power and Powerful, Radha-Krishna. We are trying to satisfy the Powerful, and in the extreme position we can see that Radharani holds the highest position of power in trying to satisfy Krishna. Question: Is this why even Nityananda Prabhu wants to expand Himself as a Manjari, Ananga Manjari: He comes from the Power, but He wants to give service to the Powerful? Srila Govinda Maharaja: Yes. Nityananda Prabhu Himself enjoys Madhurya-rasa as Mula-Sankarsana, Balarama. But He enjoys for the satisfaction of Krishna. Question: Is Balarama’s Rasa-dance of a different mood than Krishna’s Rasa-dance? Srila Govinda Maharaja: Yes. Krishna is living in Balarama’s heart. When Balarama engages in Rasa-lila, Krishna’s Rasa-lila is playing within. Another example is that a person may become aged by body but the mind may remain young in mood. An aged man may not have the physical capacity to act like a young man, but his mentality remains as a young man’s — sometimes he may hold even more of a ‘youthful mentality’ than a young man! That power of willing has a position in the Play of Krishna, and that is in the form of a Gopi. When Sankarsana wants to satisfy Krishna in Madhurya-rasa, he cannot do that in the form of a male body. He must therefore transform and go under the guidance of Srimati Radharani. We will also find there the form of Gurudeva. What is Gurudeva doing? He is giving service to Krishna. For the satisfaction of Krishna he gives us a rope to rescue us, and he takes us as a flower-offering to the lotus feet of Krishna. Baladeva is the first Guru. If we can see Baladeva we shall see that he is the first Guru and he wants to take us and offer us to the lotus feet of Krishna. We shall see that Baladeva is Gurudeva. When we see the Power of Krishna, we will see that She is the highest and She gives the highest satisfaction to the mind of Krishna. She satisfies Him to the extreme. Seeing that, the devotees very much hanker to receive such a chance of service. Immediately they search out the possibility, and they follow the Sakhis and Manjaris, and in this way their service goes to Radharani. Srimati Radharani gives the highest satisfaction to Krishna. She is the master of the ocean of Madhurya-rasa. She is the proprietor of that property, therefore everyone, even Baladeva, if they want to satisfy Krishna supremely, they must go under Her guidance. But Radharani does not give anything directly to anyone because She does not have the time. She is always busy for the satisfaction of Krishna and She always wants ingredients for the service of Krishna. Her suppliers are the Asta-Sakhis. The Sakhis not only supply various items for service, but they make many things also. They make many very nice preparations. From potatoes they make thousands and thousands of varieties of preparations for offering. In this way they make many things for the satisfaction of Radharani, and Radharani worships Krishna with these. Sometimes Krishna is very naughty and Krishna wants to meet with the Sakhis, but they do not want direct union with Krishna. The Sakhis do not have that type of mentality; their only concern is with the satisfaction of Krishna. They know that Krishna is fully satisfied with Radharani, and they supply everything. But Radharani, Herself, for the happy, varied play, offers the Sakhis to Krishna. She pushes them to have His direct association. And the Sakhis participate with Krishna for the satisfaction of Radharani, not for the satisfaction of Krishna. The Vrndavan-lila of Krishna goes on in this way. One who wants the full satisfaction of his transcendental service-life must take the position of a female. Actually all jiva-souls are female by intrinsic nature because they are sakti—jiva-sakti. Obtaining a female form they aspire to join the lila of Radha-Krishna. They always pray for the mercy of the Sakhis and Manjaris. Krishna is not their master, but he is a player, a participant. The Sakhis take the position of master. They know in which way Krishna will be satisfied, and they make arrangements accordingly. The Sakhis take the guidance of Radharani and try to satisfy Krishna accordingly. They are exclusive servants of Radharani; they are happy, and Krishna is also happy with them in that way. When Krishna says, “I am your Guru,” that is not the full conception of Krishna. He has many incarnations: He comes as Yuga-avatars, He also shows Himself as a teacher, such as when he became the teacher of the Kauravas and Pandavas. Krishna has many moods and varieties, and one variety of Krishna is that He is the Guru, therefore He says, acharyyam mam vijaniyan, navamanyeta karhicit” Which means, “When you take shelter unto the lotus feet of your Guru, you will think that it is I, Myself, who has appeared in front of you in the form of your Guru in order to rescue you from the illusory environment and to take you to the transcendental world.” Such is the form of Krishna that we see manifest there the Acharyya form. All aspects of Krishna are truth. One truth is that Krishna appears as the Acharyya in order to rescue the conditioned souls. When He appears in this way He is very merciful to the conditioned souls. Krishna cannot tolerate their painful position so He appears as the Acharyya in order to rescue them from their unfortunate position: acharyyam mam vijaniyan. But when the liberated souls in the transcendental service world try to serve, they also have a master of their own, and in the line of the Powerful they shall see him as Balarama, Nityananda. If they will follow that line, they will go to Krishna within that conception. Nityananda Prabhu and Baladeva will be there as their Guru. The conception comes from that supremely extreme plane where Krishna is present with His Power. One step down from this is the form of Mula-Sankarsana, and this is manifest for the Play of the Lord. In that realm there are many forms of Guru. His play is enacted with His Chit-shakti as well as with His jiva-sakti, and, in a negative way, with Maya-sakti. At one level is Yogamaya, by the will of Mula-Sankarsana, all the transcendental world is acquired by Yogamaya. She has full consciousness about Krishna, therefore for the play of Krishna she makes everything needed for His satisfaction. The trees, the peacocks, the deer, flowers, and everything; all are expansions of Yogamaya’s power. Question: Does Yogamaya have a form there as a Gopi? Srila Govinda Maharaja: Yes.Vrndadevi is an expansion and representative of Yogamaya. This is said in the first verse of the song of Astakalya-lila composed by Srila Visvanath Chakravarti. When the jiva-soul obtains the form of a Gopi, under the guidance of the Manjaris she tries to satisfy her masters, and they see that Radharani is the Supreme Satisfier of Krishna. Under the guidance of Radharani they try to satisfy Krishna. For the service of Krishna, Radharani is the supreme Guru. We are of the Rupanuga Sampradaya: we are followers of Rupa Goswami. Actually we do not consider ourselves to be following properly, but we are trying to be followers. The only destination we can see is in the direction of the lotus feet of Radharani. Radharani is so merciful and She can manifest Herself in many ways, so She can also come in front of me — in the form of Gurudeva. What She wants to see is our mood of service. Srimati Radharani said, “She is such a beautiful girl and she can do much seva.” And Radharani continued with her service activities. I heard this story from Srila Guru Maharaja and I cannot forget this example. Immediately such kind of fortune may come to anyone, and Rupa Goswami can take us in that way. Lalitadevi is also very merciful and she can immediately bestow her mercy upon us. Radharani has many Sakhis but eight are principle. There are thousands of Sakhis, and they have groups. There are also thousands of groups of Manjaris. First we must remember that this matter is to do with the transcendental universe. Within a second it can expand by one thousand yojanas (A Vedic measurement. 1 yojana = approx. 8 miles) and more. Srila Guru Maharaja explained, “This is the transcendental world where, for the Pastimes of Krishna, for His satisfaction there is always expansion and contraction. This happens by the will of Radharani, and Yogamaya arranges everything. When the necessity comes, distance becomes very short. And when there is necessity, distance becomes very long such as when the banks of the Yamuna expand. For the service of Krishna, everything immediately takes the suitable form to satisfy Him.” In one way, the supreme Guru is in the form of Baladeva. In a general way Krishna shows His own path of service and He becomes Guru. In the form of Guru He reveals Himself within the mundane world. 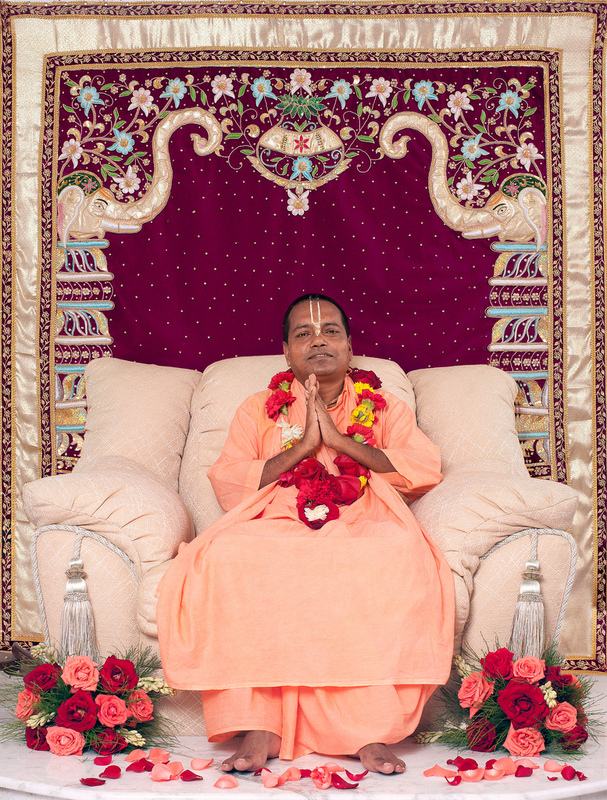 His position as Guru is also in the heart of the devotees. Supremely, where there is a variety of extreme services to Krishna, that is Madhurya-rasa. In that plane the highest Supreme Satisfier of Krishna is Radharani. And that is our line and life’s goal. We only expect that some day it may come by the mercy of Gurudeva. Whether or not we will gain admission there is by the will of my group leader, my Gurudeva.